After rejuvenating, enjoy Superior National Hiking Trails, Lutsen Mountain Recreation, or a day at Superior National Golf Course. This beautiful log structured home sits on Lake Superior. View from the shoreline of Lake Superior. Ledgerock to sit or rock climb. Cozy cabin atomsphere inside. Open kitchen full equipped with everything you need for meal preparation. Guest bedroom with queen size bed. Plenty of room for rest in this master bedroom. Twin beds in guest bedroom. Master bathroom equipped with tub/ shower combo. Master bath on main level The guest cottage bedroom is large and inviting. Sit and relax with your favorite book. The guest cottage main heating source is this lovely wood burning stove. The bathroom in the guest cottage. Front lawn entrance to the property. Grills provided for outside grilling. Rock wall separating you from the Lake shore. What a view of Lake Superior. Cool off down by the shoreline. Beautiful view for miles. Be dazzled by a North Shore sunrise over the Lake at this charming cabin. Sunrise Hollow could also be named Moon Dance Cove. The ledge rock cove directly in front of the cabin is the perfect place to watch the moon rays dance on the lake or to be dazzled by a north shore sunrise. 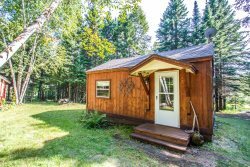 This cabin also has a private cobblestone beach, cozy interior, and convenient Lutsen location. The main house sleeps four guests in two bedrooms. The guests' cottage sleeps two in an open studio-style layout, and has an additional bathroom. This layout is perfect for a group of friends or families traveling together. You will love how cozy and welcoming this home is. Curl up in front of the wood burning fireplace or start a bonfire outside and enjoy listening to the waves roll in off the lake. The home was built in the 1940s and still has many quaint features from North Shore homes built during that era, including the original hardwood floors and arched ceilings with solid wood beams. It sits on an acre wooded lot that leads right up to the ledge rock and cobblestone beach. At Sunrise Hollow you are just a short drive away from Lutsen, MN where you can enjoy many of the area's attractions. Lutsen Mountains Recreation area has an alpine slide and sight seeing gondola and the Superior National at Lutsen Golf Course is open to the public. There are miles of hiking and mountain biking trails to enjoy. Many of the area restaurants feature live music most evenings in the summer, so be sure to pick up an activities calendar to see what's going on during your stay. Sunrise Hollow is a seasonal cabin and yours to enjoy May through October. Clean and very private. Had a very pleasant stay. Shoreline is a little rugged so those with small children need to be aware. Guest cottage is a plus for multiple couples. The cabin exceeded our expectations: the location right on the shore, the privacy of the property, the beauty, coziness and cleanliness of the cabin. We could tell it was much loved over the years--and now we know why. The layout of the cabin was perfect for our party of 6, allowing for together-time and quiet-time. Many could help prepare meals in the spacious and light-filled kitchen with all of the utensils and pans we needed. The dining table was almost like it was in a screened in porch. We also enjoyed the grill and campfire. Our only additions would be washcloths in the bathrooms (the guest house) and a tea kettle. We had quite a few tea drinkers with us. We loved our stay. Thank you. Great views. Great style and romantic. Bed was too firm. Plenty of space though and very private. Wonderful location and home. We really appreciated how spacious and comfortable it was, and it was great to have the extra privacy of a guest cabin since we were sharing with friends. Housekeeping was outstanding. We would love to stay here again.